Size: 4.4" x 2.6" x 0.30"
The LC-825 II replaced the original LC-825 within one year and introduced a slightly revised design together with the modernized LC-Display. The printed circuit board (PCB) of the LC-825 II is identical with its predecessors. 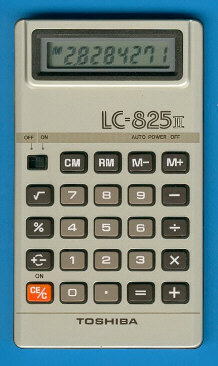 The LC-825 II was replaced soon with the LC-827 omitting the OFF/ON switch. The second life of the LC-825 II appeared with the odd HB-101. © Joerg Woerner, September 26, 2003. No reprints without written permission.